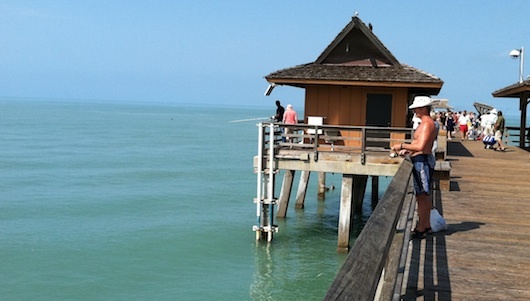 I was lucky yesterday and saw dolphins at Naples Pier -- and thanks to my iPhone, I was able to make a video for you. Make sure you watch the entire video (or skip to the end if you don't like dolphins) because there's a neat clip that I used for the out-tro of the video. It's of a wind surfer cruising pretty fast by the Pier (windy day). Usually if you stay long enough (at the Pier) you'll get to see a dolphin or two but it's not everyday. In the mornings (and sometimes evenings) it seems like it's "feeding time". There seemed to be plenty of fish out there so you'll usually see lots of fisherman as well as dolphins and pelicans when that happens.